The future of the northern white rhino looks bleak after the last known male has died. Neil and Dan teach you the language the world's media is using to discuss this story. 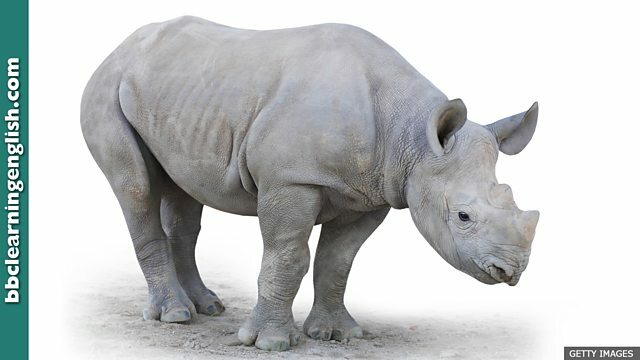 There are only two northern white rhinos left in the world. The last male, called 'Sudan', died on Monday. Only his daugher and granddaughter are left. Neil and Dan bring you the language you need to talk about this story. a) His boss criticised him publicly. b) His boss fired him. c) His boss demoted him to a role with less responsibility. The world's last male northern white rhino has died in Kenya, bringing the subspecies to the very brink of extinction. The 45-year-old rhino was in poor health and was put down on Monday. His daughter and granddaughter are the only females remaining. 'Put down' is the opposite of 'pick up'! Which of these is NOT a meaning of 'put down'? This word has two letters. Complete this sentence: The future of the northern white rhino is ______ doubt. You need two short words. Complete this sentence: You committed the crime: now you have to face ______ the punishment.